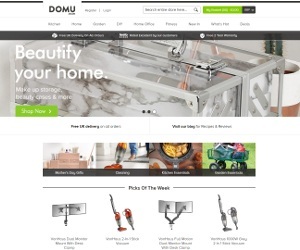 Domu is a leading retailer of Homeware, Kitchen and Cooking Equipment. They pride themselves on handpicking each individual product. Their catalogue of products have had plenty of research put behind them to ensure customers have the latest, must-have products. With Free UK Delivery on all orders, it's no wonder how Domu have become such a fan favourite, excellent rated on feefo and a free 2 year warranty all accumulate into a fantastic customer experience. Can I get Student Discount from Domu ? Unfortunately Domu don't offer Student Discount. If this changes we will update this page to reflect the new discount amount.